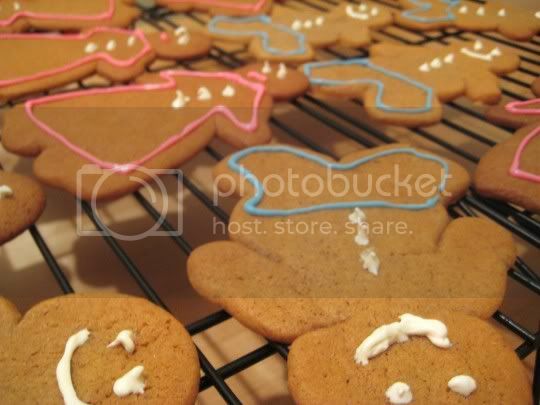 This is one good gingerbread cookie: thin, crisp, sweet, perfectly spiced, and cute. They also, for some reason, taste somewhat like graham crackers. The flavors of cinnamon, ginger, and molasses really come through, and as you can imagine, the aroma when the cookies are baking is wonderful. These cookies are pretty easy to make, but things can get a little tricky when rolling the dough. There will be a lot of it, so you'll have to work in batches. And I can't stress this enough: make sure you flour your rolling surface AND the dough GENEROUSLY. Otherwise, this dough will stick to everything, and things will get messy and frustrating. It's probably best working with dough that's been refrigerated overnight, because it starts to get a little too pliable when it sits at room temperature. Oh, and have fun decorating! I used a specialty candy icing (the kind that needs to be melted to decorate, and will then quickly harden again) that I found at a cake decorating store. I'm not sure regular icing in grocery stores will work if you want the decorations to set. Make again? Yes, these would be fun for the holidays.